The colour of Lamborghini leather, or the mark of classic Louboutins, black and red has long been symbolic of life’s most extravagant luxuries. But where do these heady hues fit into the world of interior design? Colour psychology tells us that black denotes mystery, power, elegance, and sophistication. Red embodies passion, excitement, love, strength and desire. Together, this colour combination creates quite the impact. Black and red wallpaper is certainly not for the shy and retiring. If you’re looking to go bold with your design scheme, this intoxicating colour duo will do just that. Shopping by colour with wallpaper is one of the best ways of channelling your personality into the design of your home. For the fiery, passionate, flashy or seductive, black and red wall murals can transform boring into brilliant in an instant. And if you need inspiration, here are some black and red wallpaper ideas to spur you on. If you’re interested in travel, Chinese food and Chinese culture – or you just love the colour red – this incredible design will add some far eastern charm to your home. If you have a big blank wall that needs filling, something as daring as this can be a fantastic conversation starter. Our Chinese New Year Lantern wallpaper works as a beautiful dining room mural, transporting you and your dinner guests to somewhere more exotic. Want to achieve an oriental theme with your décor too? Then choose natural finishes such as rattan, bamboo, water hyacinth wicker, and wicker cane. Light coloured woods work best, but black mahogany can also achieve an authentic look if you have enough natural light flooding in. Lighting is key when it comes to busy wallpaper features like this one. So make sure you’ve considered the best light fittings when you redecorate. 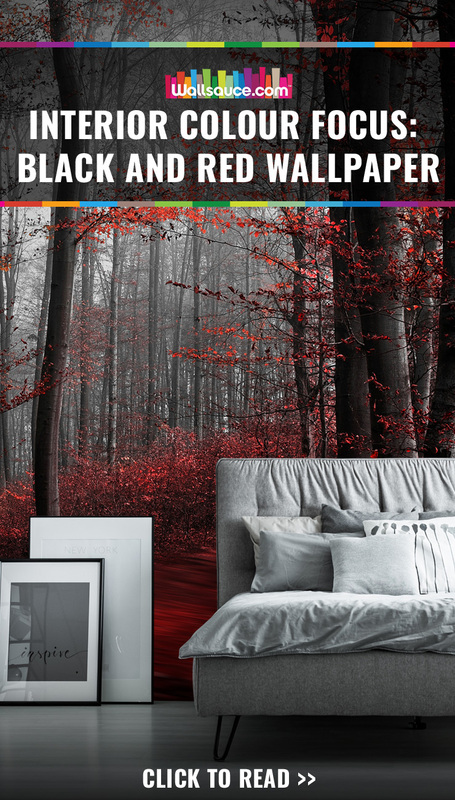 If you’re looking for something modern, edgy and enigmatically chic to cover your bedroom walls, combining black and red can help you create something totally striking. 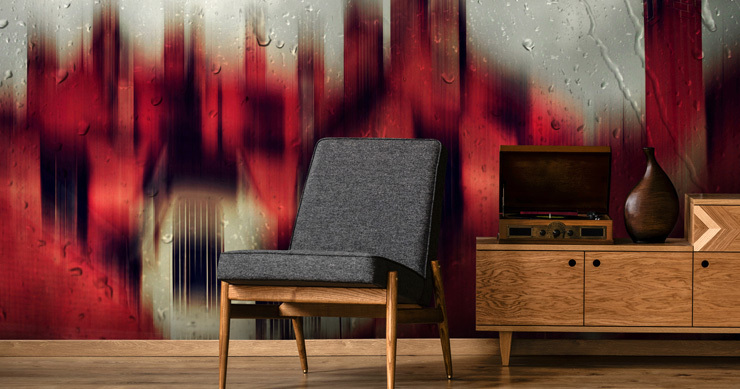 The washed out colours in this Love Story wall mural fit in with this season’s Black, Red and Blush Trend, setting the scene for your favourite mid-century mod furniture pieces. This black and red wallpaper design works well as a feature wall behind a wood or upholstered bed. Just be sure to choose some muted tones, like greys, browns, terracotta and brick for your linens and fabrics. Or opt for clean, contrasting white to create a juxtaposition of light and dark. Bring black and white wall murals to life with a splash of vibrant colour. 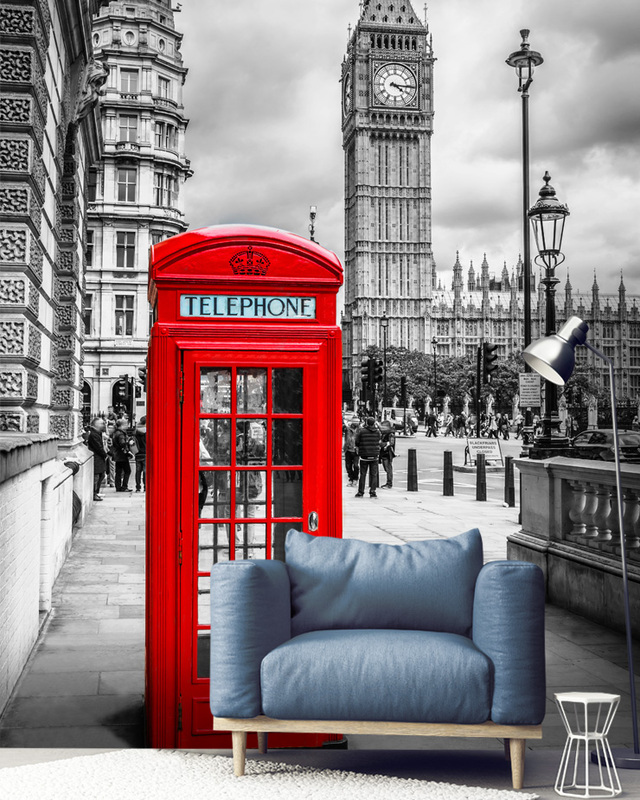 This lovely London-themed wallpaper is perfect for those large, open plan spaces in need of bold design and eye-catching features. 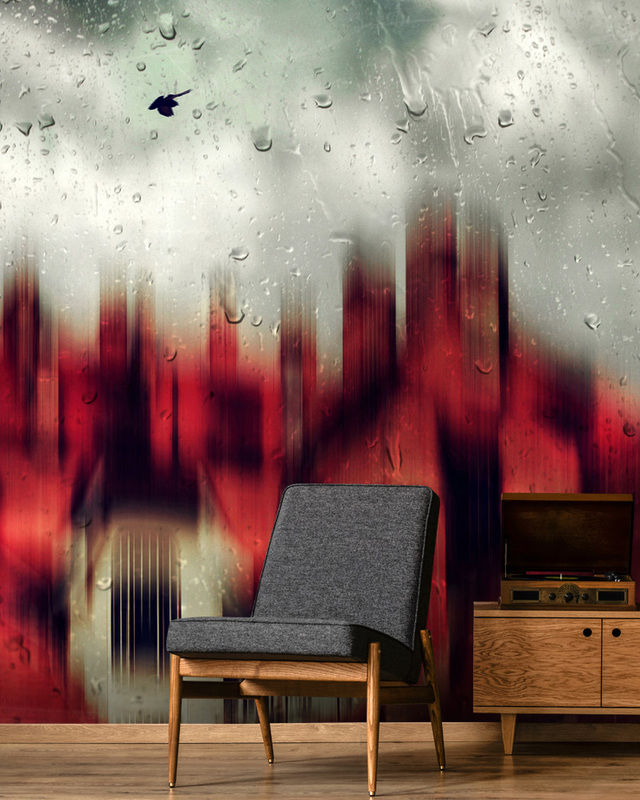 Our London Telephone Box wallpaper is just one of a number of red ‘colour splash’ murals featuring our cool capital. There are also some similarly stylish ones of New York, Paris and Lisbon so you can find something to celebrate your favourite city. Clean lines and minimalist seating or industrial dining tables are a match made in heaven for an urban backdrop like this, and exposed wooden floorboards are the ultimate must-have when your apartment is made for entertaining. This Black Dragon wall mural is not designed for harmony or balance. It’s designed for maximum impact – and that ‘wow’ factor as soon as you walk into the room. Due to the colour intensity, and the fierce contrast between black and red, we think it is best suited for larger rooms where there’s enough natural light coming in. But matched with minimalist furniture, it can also work well in small to medium sized bedrooms. Perhaps for someone who was born in the year of the dragon…..or just a fan of Chinese mythology? Keeping the room organised and uncluttered is the key to making the wallpaper look its best. So make sure the intended space has ample storage and hiding places. We think this mural works particularly well with white furniture or light woods, but can also blend well with darker finishes too. Red and black wall murals don’t get more eye-catching than this. 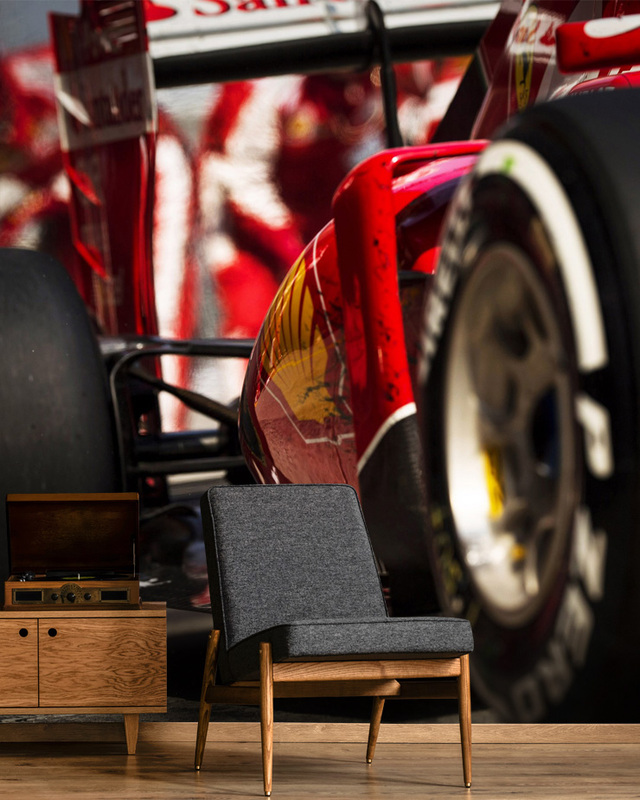 Our formula one wallpaper is a petrolhead’s dream. Whether you’re furnishing a bedroom for your car-mad teenage son (or daughter) or looking to hit the acceleration on the bachelor vibes in your apartment, this mural is the ultimate statement. Or maybe you’re adding a ‘man cave’ to your family home, somewhere you can escape to for gaming, action movies and respite from the daily grind. Well, we have a range of sports wallpapers that can help you personalise your space, and make it completely unique to your hobbies. 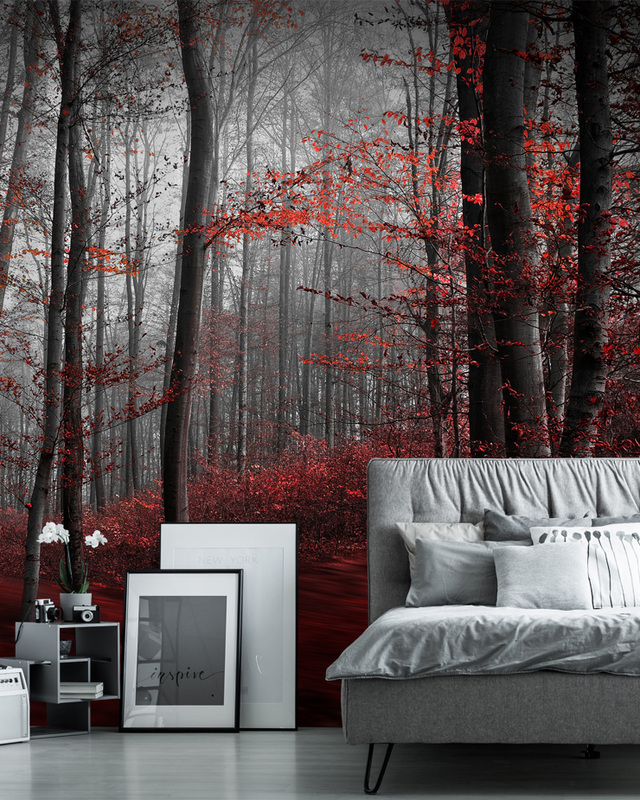 There’s something so wintry and atmospheric about this Red Carpet Forest mural. But the red hues are perfect for autumn too. No matter what season you’re in though, we think this photo wallpaper looks spectacular all year round. Ideal for creating a sense of calm or romance, and wonderful for any living space, bedroom, office or library. Compared to pillar box reds and sports car reds, the hues seen here are all about richness, depth, comfort and warmth. So there’s a sense of relaxation, just as you would expect from our scenic forest and tree wallpaper collection. Style the room with warm wood finishes, such as honey oak, ash oak or walnut. And incorporate neutral colours like beige and oatmeal to let the scenery do all the talking. From scarlet to plum, burgundy to brick, there are so many shades of red to explore. If you’ve been scared to use this fiery colour palette in your home, it’s time to rethink rouge. Because it’s easier to coordinate than you may think, and some of our red wallpapers are ultra-mellow in tone. This Jazz Trumpet wallpaper mural, for instance, harmonises a soft carnelian red with abstract black. Making it a versatile colour combo to complement existing flooring and furniture. Contrast with primary colours such as blue and yellow in your décor, or keep it elegant with muted shades. In the summer, balance out the room with a potted fern or some pretty white oncidium flowers. Comment below to let us know what you think of our black and red wallpaper mural ideas. Could you see yourself adding black and red to your home design? Or are there any interior themes you want us to write about? Feel free to use our comments section to make requests!